Home » Blog » Street Art » Some thoughts on commodification and street art…. 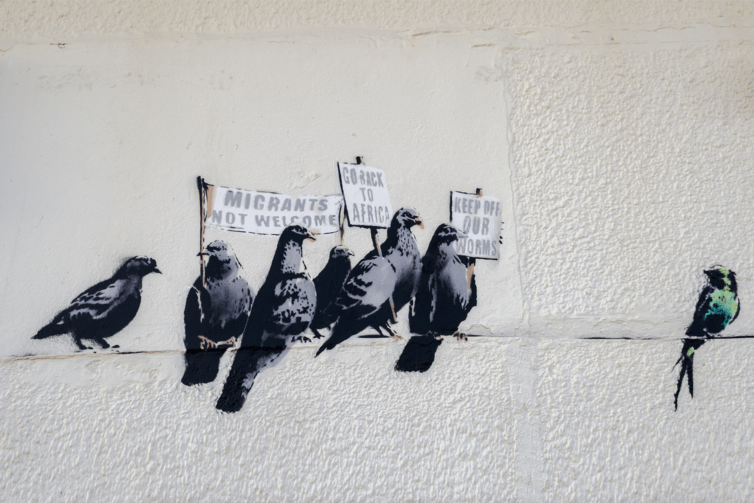 As a major exhibition of works by famed British street artist Banksy opened in Melbourne, network researcher Alison Young recently published this piece in The Conversation on issues relating to the commodification of street art. Take a selection of artworks by the most famous illicit artist in the world, add a city that’s passionate about its street art and a dash of controversy: the result is the new Melbourne exhibition The Art of Banksy. Named in 2010 as one of the 100 most influential figures in the world, Banksy’s career began in Bristol in the 1990s, where he enthusiastically participated in the city’s graffiti scene. In the early 2000s, he adopted stencilling as a technique, and became part of the art movement now called street art. Whereas graffiti involves a stylised calligraphy that centres on the repeated writing of an individual’s chosen name, or “tag”, street art allowed for a greater diversity of content and technique: with paste ups, stencils and layered images. Banksy organised events in London such as Santa’s Ghetto, where an empty shop was taken over for the display of works on canvas or paper by artists – thus by-passing the gallery system – and his print workshop Pictures on Walls made editions of prints by various artists available for online purchase at affordable prices. These print editions became so popular that fans would spend hours online attempting to buy works. While some wanted to own a Banksy print, others were buying for re-sale. His prints quickly acquired a secondary market – increasing fivefold in value in a day. After the financial crisis of 2009, the market value of work by many street artists faltered – but the price of Banksy works did not. He has maintained that crossover from the street to the mainstream art world. Banky’s street art is highly distinctive and sought after. The Art of Banksy is the direct consequence of his successful negotiation of the dividing line between the street and the art business. Indeed, the show exhibits works owned by private collectors, including Banksy’s former business manager Steve Lazarides, proprietor of the Lazarides gallery in London – famous both for his long association with Banksy and their very public estrangement. 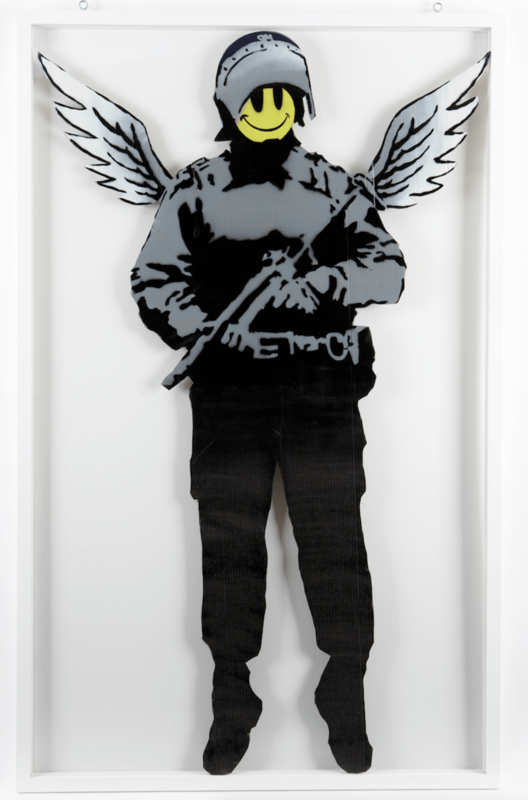 The exhibition provides equal billing for both Banksy and Lazarides, who is credited as the show’s curator. Much has been made in the media about the artist’s purported unhappiness with the exhibition (“the show is definitely unauthorised”) Lazarides told one journalist. But this is by no means unusual, as I’ve written about in my book, Street Art World. Works owned by private collectors are often shown in galleries with no consent needed from an artist. The Andipa Gallery in London was the first in 2007 to exhibit privately owned Banksy works, and the street art show Outpost, held in Sydney in 2011, exhibited Banksy works from George Shaw’s New Zealand-based collection. Inside, the show is all Banksy. But the works are not displayed in a conventional gallery setting. The interior is said to be “inspired by the streets of London”, and is organised around the recreation of shopfronts, city streets and dimly lit spaces. The majority of works are prints, which line the “walls” of these recreated streets, with some larger pieces on canvas, tarpaulin or wood. There are also a few sculptural pieces, such as Bullet-Proof David (Suicide Bomber) from 2006. Banksy artwork is displayed on fake, London-style streetscapes. For those who have only ever seen Banksy works online or in books and films, the show provides a chance to see his art close up, and it’s certainly interesting to analyse the works for their signature techniques (limited colour range, satirical text, humour, and light political themes). They also give a glimpse into a key period in Banksy’s artistic development, the early-late 2000s. Flying Copper hanging in a frame. A number of works are badly displayed: Bullet-Proof David is half-hidden by curtains and diminished by being placed on the floor rather than a plinth. Many near-identical prints are included; and there’s little effort made to contextualise the videos that run in some of the rooms. Visitors who don’t know much about Banksy’s history may find themselves struggling to work out what they are seeing. The streetscape has an eerie artificiality: no London street ever looked so antiseptically clean and tidy. Exhibiting Banksy in Melbourne is also rife with contradictions. Banksy is much loved by Australia’s street art community, many of whom fondly remember his visit here. His remaining works in the city are regarded as endangered – gradually fading as the years go by, and also at risk from council cleaning crews and construction workers. In 2010, a council worker painted over a Banksy rat in Hosier Lane, not realising it had been painted by the world’s most famous street artist. The outcry prompted the deputy mayor to apologise to the city for the loss of a cultural icon – which in turn led to anger among members of the local street art community, who face severe penalties if caught painting on walls without permission. Illicit art is still subject to prosecution and punishment in Melbourne: Victoria has some of the harshest penalties in Australia for graffiti, and while Melbourne’s Lord Mayor, who attended the exhibition’s opening party, has spoken publicly about his support for street art, it’s clear that his support is for murals done with permission in designated places. Banksy’s street works – which are illegal – would be categorised as vandalism if done in Melbourne. For all Melbourne’s reputation as one of the street art capitals of the world, its city authorities have an uneasy relationship with the art form. Gift shop merchandise at the show. Back in 2003, when Banksy was visiting Melbourne, street art was seen as a way of circumventing the gallery system and about creating artwork for the public, free or at a low cost. So much of that has changed: street art is now highly commercial. But it’s not so much that artists are selling their work at higher and higher prices: to make a living from one’s art is an understandable ambition. But nowadays street art has been turned into a range of secondary products: calendars, gift cards, tea towels, and T shirts. Given that the exhibition represented an opportunity to provide an Australian audience with a chance to see so many Banksy works in one place, what is really surprising about The Art of Banksy is the way that its commercial interests seem to outweigh the display of the artworks. Entrance to the show is $30, and, upon reaching the end, visitors find themselves confronted with a range of secondary merchandise for sale: baseball caps, mugs, cloth bags and fridge magnets. Is this “exit through the gift shop” an ironic and knowing wink at Banksy’s critique of the commercialisation of street art in his 2010 movie? Is it possible to own an ironic Banksy mug? In the city where street artists can be punished for possession of a spray can, The Art of Banksy takes the commodification of Banksy one step too far.